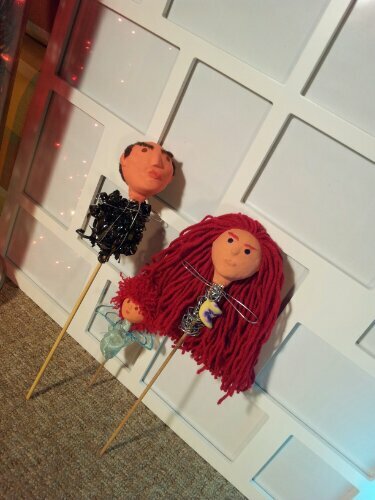 I realised the voice over I recorded during the puppet making was perfect for an emergent practice film. The audio tells a personal story of how unhelpful beliefs can form when blindly trusting the word of an authority figure; questioning snips away the ties that bind the belief in place allowing a realisation of some of the reasons why I make art. This realisation will help me to experiment with the purpose of art in future projects. The audio fits nicely over the speeded up footage of me making the puppets. My words are not scripted and there is plenty of space between questions and answers. The slowness of the audio contrasts with the fast speed of the visuals, although there are occasional clips played at normal speed (23.967 fps), and this creates breathing space in the visual track. The third audio clip is different from the previous two in that tearing sounds can be heard, which do not match the visual images. I like this because it shows the temporal mismatch of the visual and audio tracks; it’s a reminder of the constructed nature of film. After putting the sound and images together I thought about bringing the puppets to life. I wanted to use them in a way that was fun and nonviolent as an alternative to the domestic violence usually advocated by Punch and Judy professors. There is a song, Lean on Me by Bill Withers, that I’ve sung at parties or (ahem) in the kebab shop or in the street and people join in singing with me. It makes me smile and it feels good to sing together. I decided the puppets would sing this song. I phoned Justine and she agreed to sing for Delores, the female adult. Andy agreed to sing for Bill Senior. I recorded myself singing as Bill Junior then Justine listened to me through headphones and sang along as I recorded her. Andy did likewise. Next I filmed the puppets (Andy and Justine moved them around in realtime) dancing and ‘singing’ against the backdrop of a large picture frame; the frame has marked out holes for pictures but it’s empty. This links back to audio during puppet making in the film where I talk about the effect of believing I wasn’t good enough to do art: I stopped drawing and painting for a long time. Judy had suggested, during a tutorial, that I film the puppets in my wardrobe with painted scenery backdrops but that was before I was ready to work with the puppets and, of course, now I was ready it didn’t tie in with the emerging story. This entry was posted in sound and vision and tagged bill withers, editing, filmmaking, lean on me, puppet making, sound and vision by Julia Fry. Bookmark the permalink.